Check out the video on this beautiful used 116' Lazzara yacht for sale! : Atlantic Yacht & Ship, Inc. Check out the video on this beautiful used 116′ Lazzara yacht for sale! 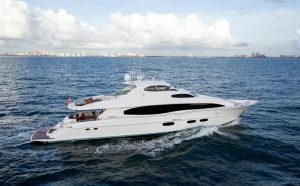 Check out the new video on the beautiful used 116′ Lazzara yacht that Chris Carroll has for sale! In the first place, this 116′ Lazzara is known as “Long Aweighted”. Altogether, this is the most turn-key motor yacht in her class. In fact, all services and upgrades have been completed. Furthermore, she enjoyed a full fresh paint job in August 2016. Overall, she have five staterooms, zero-speed stabilization, and low hours! On the whole, this 116′ Lazzara yacht for sale will not disappoint. Launched in 2008, she affords you the opportunity to escape to the water in true comfort. Very few yachts can match the endless features she has and none can match the design. Bring your entire extended family cruising as the five staterooms accommodate up to 12 guests. Additionally, please remember that she has three separate staterooms for your crew of up to five. Also, your experience has been considered with the hydraulic swim platform, jacuzzi, elaborate stereo system, and so much more. For more information on this beautiful used 116′ Lazzara yacht for sale be sure to contact Chris Carroll today! Check out the video on this beautiful pre-owned 116′ Lazzara yacht for sale! Just listed – this beautiful used 116′ Lazzara yacht for sale!